Today I took a video of Rich planting a new potted hazelnut tree into our orchard. 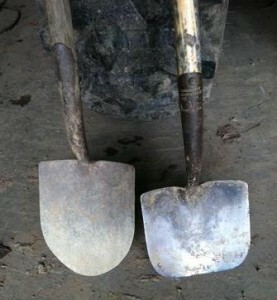 A planting shovel is thinner and sharper than a standard spade or construction shovel. Planting shovels also have a flat end rather than a point. Much easier on your workload, and makes a nice flat-bottomed hole. DO NOT plant the tree any deeper than the pot. Hazelnut roots are shallow; their main taproot only goes down a couple of feet. If you plant more than 1 inch deeper than your pot, the next year’s growth will be stunted while the tree grows its roots towards the surface. DO NOT crunch the soil down with your foot. It puts stress on the roots and is less effective than tamping with the handle of the shovel. DO prune your trees every year for the first 5 years to shape them. The first year of pruning simply means you create a single whip with no branches that’s about 32 inches high. In the coming years, the tree will produce much more luxurious growth if you take the time for this simple pruning when you plant. This entry was posted in Hazelnuts, How To, New Tree Care and tagged New Tree Care. Bookmark the permalink.